Training in tabla technique, rhythmical math, and accompaniment of other art forms such as: vocal, kathak dance and North Indian classical instruments. Education in Indian history, philosophy, culture and etiquette. 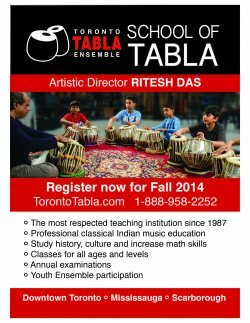 Performance opportunities with the Toronto Tabla Ensemble and other artists, including world renowned Pandit Chitresh Das. Pre-professional Youth Ensemble and leadership program under direction of Ritesh Das. Extensive formal examination process enabling students to measure progress and receive certificates for achievements. Learn the tabla of North India as it is performed in Hindustani (North Indian) classical music. Shawn Mativetsky teaches tabla in the tradition of the Benares gharana. An Outstanding Performer & Teacher of Tabla now Teaching Tabla & other Percussion in Toronto and other areas of Ontario. Brampton: SAAZ-O-AAWAAZ Academy of Indian Music. Indian Music Academy That is based in Brampton and teaches Indian Classical Vocal,Sitar,Harmonium and Tabla etc.